As a freelancer, you’re constantly spinning plates. Whether it’s finding work, jumping between projects, or meeting crucial deadlines, freelancers always have a lot on their mind. Occasionally, you can get so caught up in the actual work that you forget about getting paid. 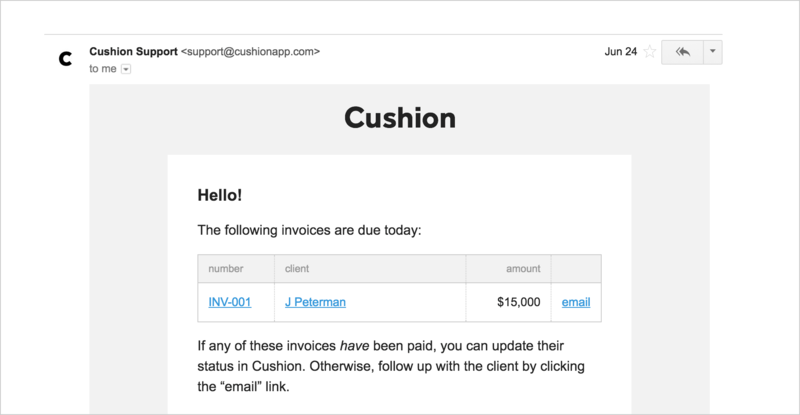 With Cushion’s new Invoices Due Today email, you’ll never forget another invoice. On the day an invoice is due, you’ll receive an email if it hasn’t been paid yet. The email includes a list of any invoices due that day, along with a 1-click link to follow up with the client. Also, if any invoices are late, Cushion will include those in the email as well—to make sure they don’t slip through the cracks. Eventually, we plan to automate this entire process with auto-reminders.